Hello my name is Beverly Nurse. I have been married to Jeremy for nearly 30 years and we have two grown up sons, Sam and Joe. I have a background in Nursing ( yes my surname really is Nurse!) having trained at The Royal London Hospital in the 80’s. I was an RGN working in general surgery in Whitechapel, London, then I moved on to the Coronary Care Unit in Crawley, continued as a Staff Nurse on the District around Redhill and Reigate, before returning to Crawley to work in General Practice. On moving to Lindfield I enjoyed a spell of Geriatric Nursing working nights at St Peter and St James Hospice and at Compton House Residential Home. When the children were young I stopped nursing altogether and was then employed as a Crèche Coordinator at our local church for a couple of years. 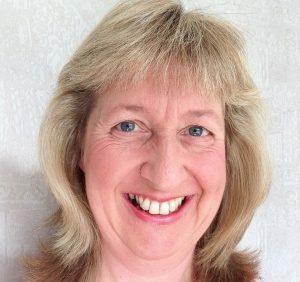 I progressed from looking after babies to pre-school children in a local Nursery and finally I was employed for 9 years as a Teaching Assistant with 5 to 7 year olds at a local Prep School. Nowadays things are very different as you can find me working as a volunteer two afternoons a week at the St Peter and St James Garden, Furniture and Home Hospice Shop in Lindfield which I thoroughly enjoy. I love to Sing and Dance and have always loved to do so. I belong to a choir called “inChoir” which I attend twice a week. At home the radio is always on and the family are often used to seeing me jig about, singing, moving and even whistling! I regularly attend Swoove classes to help keep myself fit and they are always so much fun and uplifting. When I’m not singing or performing with choir, volunteering, or Swooving I enjoy a spot of gardening, musical theatre and drama, entertaining and socialising with friends particularly with good food and drink thrown in, travelling and above all spending time with my lovely family. 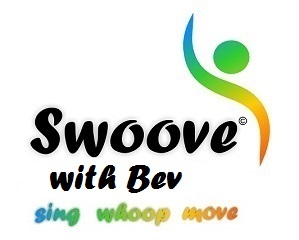 Bev’s Swoove Groove classes are taking place at King Edward Hall, Lindfield on Thursdays from 1pm-2pm. The very first class starts on 5th November and this session is free. All other classes are £5 per session. Loyalty cards are also available to purchase. 6 classes cost £25 (1 class free) or 12 classes cost £50 (2 classes free). Classes will run every Thursday up until and including December 24th, Christmas Eve. The following term will restart on January 7th 2016.